Braces for Teens & Tweens. Come visit Dr. Leo for a complimentary consultation and see if your child is ready for Braces. Does your Tween still have any baby teeth? If not, he or she is most likely ready to start braces. Generally, I would like to see your child before the last couple of baby teeth come loose. If you aren't sure, come to my office for a complimentary consultation. Important: Don't wait too long! I want to plan your child's treatment around his or her growth spurt for the best results in orthopedic jaw alignment. Children's bone and muscle structures develop rapidly at this age, providing a window of opportunity. Register your Tween/Teen as a new patient for a complimentary consultation. I use only high quality orthodontic appliances. I recommend metal, for speed and strength. We begin with a complimentary free consultation. 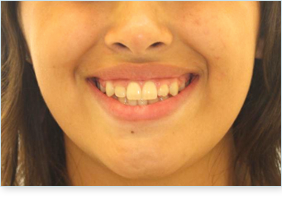 I will do a clinical examination to determine if your child is a candidate for braces. Next is taking records – we will take photos, x-rays, and impressions. I will use this information to develop a precise treatment plan which we will discuss prior to starting any work. We may place a separator between the back molar teeth in preparation for molar bands. Next, on your child's next visit, molar bands are fitted and cemented, depending on availability when indicated, We can bond brackets on the other teeth as well. You can help your child's smile by encouraging him or her to develop good habits. If rubber bands are prescribed, they must be worn 24 hours a day, except while eating or brushing teeth. Otherwise a less than ideal orthodontic result will occur. Good oral hygiene is important for avoiding dental decay and white scars on teeth. I look forward to being a partner in your child’s orthodontic treatment! If you don't have dental insurance, don't worry. We strive to keep our fees affordable, and offer several payment plans starting at $99 downpayment and no credit check with 0% interest. I believe in touching as many lives as possible, and I truly want to make an uplifting difference in your child's life. I will try my best to make orthodontics affordable for everyone who seeks my help. I am very pleased to be working with Smiles Change Lives® offering a very low cost orthodontic treatment to those children who deserve it most. Please visit their website and refer anyone you know who may benefit from this program. Many dental insurance will cover a portion of the costs for children’s orthodontic treatment. For your convenience, please provide the details of any dental insurance you have in advance. We can look into it, and determine the extent of insurance coverage, before your complimentary initial appointment. braces for $99 down, 0% interest and no credit check! Orthodontic Braces Treatment Tucson - How long does it take to see changes in your teeth during an orthodontic braces treatment?